Questions are often asked about Monaco beaches. Are Monaco beaches free? What are the best beaches in Monaco? Does Monaco have a beach? Are there pictures of Monaco beaches? 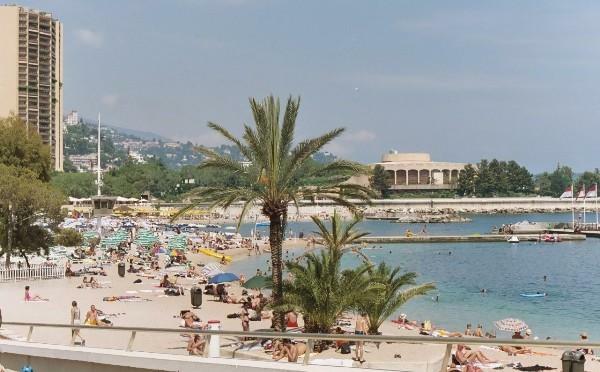 Well, if you are in Monaco and travel East towards the Italian boarder along Avenue Princess Grace you will find the Larvotto Beach which is the only public beach in Monte Carlo. It is well served by Monaco’s bus lines and you can take the number 4 or 6 bus to get there. If travelling by bus it makes sense to buy a day travel card or La carte touristique which gives unlimited travel and can be purchased on the bus. The beach itself is a man-made gravel beach but very clean and backed by the expensive high rise apartments of Monte Carlo. During the warmer months and due to the increase in the number of jelly fish (meduses), the authorities stretch a net across the bay to try and catch them. There are bars and restaurants backing onto the beach including some lounge style bars and restaurants with their own private beach front. Like many of the Riviera beaches, Larvotto beach can get very crowded in summer. Another option is to walk west along the coast from Monaco and past Stade Louis II until you reach Port de Cap D’Ail. Just past the port you will find the delightful beach of Plage Marquet backed by flower beds and palms. Apart from the above beaches and if expense is not a consideration, then just up the road on the Eastern boarder of Monaco is The Monte-Carlo Beach, a palatial hotel with a beach of artificial sand. The hotel also has an Olympic size swimming pool. Please go to our Monaco web page for more information about Monaco and Monte Carlo.